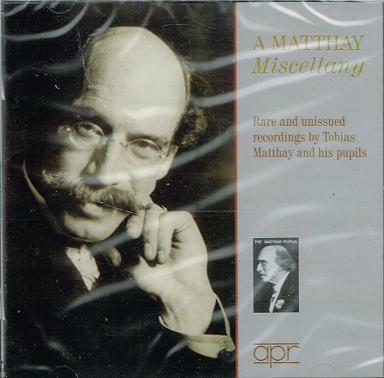 “This final volume of APR’s Matthay Pupils series presents most of his remaining students who left recordings, as well as the few discs Matthay himself made. Of particular interest is a selection from the almost unknown AFMC label which was affiliated to Matthay’s school and featured many of its staff. Also included are recently discovered unpublished Irene Scharrer recordings which add considerably to her discography. Tobias Matthay (1858-1945) stands among the most influential of Britain’s music pedagogues, having taught Harriet Cohen, Irene Scharrer, Myra Hess, and Moura Lympany. This volume introduces us to rare and unissued recordings made by several of his other pupils, including elusive documents cut for the Anglo French Music Company (AFMC) between 1923-1928. Matthay himself appears in two sets of recordings made, respectively, in 1932 and 1923, devoted to his own music. 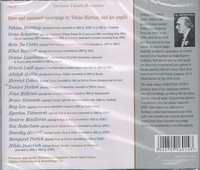 For the collector of historical recordings, this set (with transfers by Mark Obert-Thorn) represents a true labor of love for a great British pedagogue and his devoted acolytes, many of whom bore star status entirely their own. 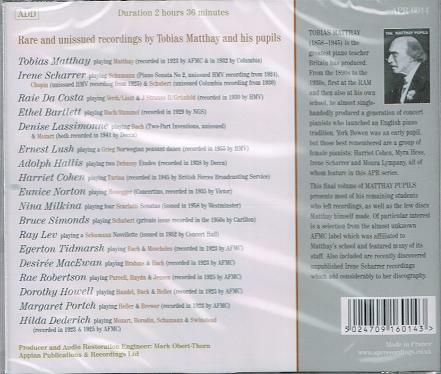 "This final volume of ‘The Matthay Pupils’ presents most of his remaining students who left recordings, as well as the few discs Matthay himself made. Of particular interest is a selection from the almost unknown AFMC label which was affiliated to Matthay's school and featured many of its staff. Also included are recently discovered unpublished Irene Scharrer recordings which add considerably to her discography." “Tobias Matthay is one of the most controversial figures in twentieth-century piano pedagogy. Glorified by some and villified by others, he left copious theoretical writings which today are little studied by serious pianists and teachers. In 1922, Frederick Corder, a composition professor at London's Royal Academy of Music, wrote that Matthay had revolutionized piano teaching and brought British pianism to new heights internationally. By contrast, less than fifty years later, British composer and pianist Alan Bush declared that Matthay was ‘the ruination’ of pianism in England. And despite the fact that the American Matthay Association has flourished nearly continuously since 1925, in 1963, Harold Schonberg, the chief music critic for THE NEW YORK TIMES wrote approvingly that modern theorists ‘ridicule’ Matthay's antiquated ideas. Ironically, for his entire life, Matthay revered science and sought to apply the scientific method to piano instruction, but after World War I, his ideas were repeatedly attacked as ‘unscientific’. Matthay entered London's Royal Academy of Music in 1871 at the age of thirteen, and eight months later, he received the first scholarship given to honor the knighthood of its principal, Sir William Sterndale Bennett. Bennett, one of the most iconic figures in nineteenth-century British music, became his first composition teacher, and when he died three years later, Matthay's instruction was undertaken by Sir Arthur Sullivan, Bennett's most famous pupil. Matthay himself became an RAM professor in 1880, and within ten years he was beginning to make his mark as a pedagogue with unorthodox ideas. He began to write extensively, articles at first, and then his encyclopedic THE ACT OF TOUCH, which appeared in 1903, and was viewed as revolutionary by many in the field. Soon, Matthay had so many pupils that he had to open his own school, first at his home in Hampstead, then briefly on Oxford Street, and by early 1909 at 96 Wimpole Street, where it remained for the next thirty years. At the same time, he and his wife, Jessie, completed their dream home, a country retreat overlooking Marley Commons in Sussex, which he called High Marley.